Charm bags, also known as mojo bags and gris-gris bags, may be the most popular style of amulet or talisman in the world today. Around the globe, they are crafted by people from many cultures and spiritual traditions and are created for many purposes. Until now there has been no definitive guide to the art of creating these magical power objects. The Magical Art of Crafting Charm Bags remedies this situation. Author Elhoim Leafar provides an introduction to the topic in this clear, focused book of practical magic, which features detailed instructions for making these bags. The strongest amulets are those you make yourself, and The Magical Art of Crafting Charm Bags shows you how. 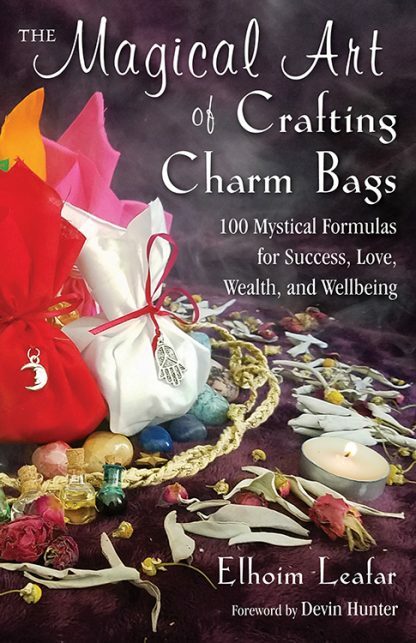 The Magical Art of Crafting Charm Bags contains 100 formulas intended for various purposes including love, luck, success, happiness, health, wealth, protection, prosperity, and the attainment of goals and desires. Based on an eclectic blend of Wicca, hoodoo, and Latin American folk magic, the book also contains extensive lists of herbs, gems and minerals, essential oils, astrological positions, and colors that contribute to making your own personal amulets. Instructions for casting circles and how to charge your charm bags are also included. Elhoim Leafar, a resident of New York City, is a shaman, diviner, and traditional magician who hails from a family of spiritual and magical practitioners from Venezuela. He is also a palm reader and dowser dedicated to teaching the principles of practical magic and spirituality.